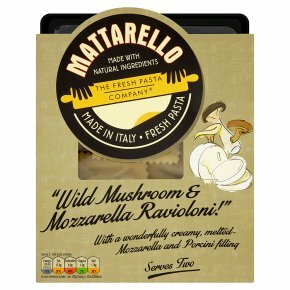 Fresh pasta parcels, made in Italy with a wonderfully creamy, melted-mozzarella and porcini filling. Made with natural ingredients. With a wonderfully creamy, melted-mozzarella and porcini filling. Made in Italy. Fresh pasta. Ready in under 10 minutes1. Boil 1 litre of salted water per 100g of pasta.2. Add 125g per person and return to gentle boil. Simmer for 5 minutes. (no need to separate, pasta parcels separate naturally during cooking).3. Drain, toss with melted butter and serve immediately. Sprinkle with Parmesan cheese.